Banksy, originally uploaded by Hookedblog. 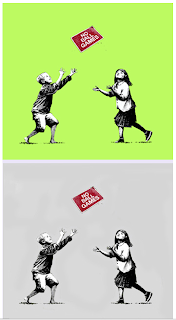 Pictures On Walls is getting set to drop Banksy’s latest screenprint release “No Ball Games”. The image appeared on the streets of London in South Tottenham earlier this year pictured above. The prints are being released as part of POW christmas show "Fiesta Resistance". The new editions will be released in two colourways, a green and a grey version both pictured. The green version of the "No Balls Game" print will be released online via the POW website and the grey version will be available from POW's Store only. No details on the online release yet but the grey version will drop on the 12th December at 11am and it will be sold on a first come first served policy. We have heard that there are Banksy fans already queueing outside POW shop waiting for tomorrows release. With London temperatures set to drop to -7 tomorrow morning, they are gonna have a long cold wait for their prints! !